Leitrims James Glancy gets a chance to play for Ireland in the Senior Hurling/Shinty Internationals against Scotland on Saturday next, October 18th. 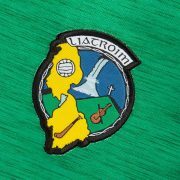 Well done to James on making the Squad and best of luck from all in Leitrim. The GAA have announced the squads which have been selected for the Under 21 and Senior Hurling/Shinty Internationals against Scotland on Saturday next, October 18th. The Senior International takes place in Nowlan Park, Kilkenny at 3 pm while the Under 21 will be held in Durrow, Co. Laois at 12 noon. Manager, Lester Ryan has named a very strong Senior squad which includes Derek Lyng, Tommy Walsh and Eddie Brennan from All-Ireland champions, Kilkenny as well as Corks Seán Óg Ó hAilpín. The panel also includes three representatives from Carlows Christy Ring Cup winning side, Des Shaw, Edward Coady and Shane KavanÓgh, who captains the side as well as Dermot Clarke and Michael Gilmartin from Nicky Rackard Cup winners, Sligo. The Under 21 panel named by Manager, Paudie Butler is primarily made up of players from counties which play in the Christy Ring and Nicky Rackard Cup. The side is captained by John Rogers (Carlow) and also includes Sean Bourke from the host club, The Harps, as well as Keith Raymond (Sligo), man of the match in the Nicky Rackard Cup final and Niall Kilcoyne, son of Westmeaths only All-Star, David. The Under 21 game takes place in Durrow, Co. Laois at 12 noon on Saturday next, October 18th. It is hosted by The Harps GAA Club in conjunction with the Durrow Tri-Centenary celebrations.